Space may be the final frontier, but for customers exploring the all-new, and newly available, Audi A4 Avant it is likely to be one of the first and foremost considerations. Fortunately the five-door version of What Car? Magazine’s 2016 Car of the Year proves to be a star in this respect, offering the most expansive seats-up luggage capacity in the premium compact executive sector to complement the quality, technological ingenuity and optimal efficiency for which the A4 is already renowned. The even more versatile A4 can now be ordered at prices ranging from £27,300 OTR to £40,350 OTR, and retention of these original values is likely to be another important consideration for prospective purchasers. 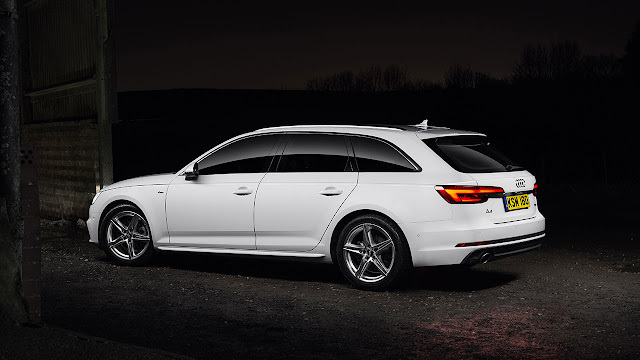 Here, too, the A4 Avant doesn’t disappoint, with leading trade guide CAP Monitor predicting that the majority of versions will achieve residual values that are either strongest in the premium compact estate class or unbeaten in the class. As an example the A4 Avant 2.0 TDI ultra Sport 190PS – the expected best-seller in the range – is predicted to retain 40 per cent of its value after three years or 60,000 miles, ahead of its key premium sector rivals. 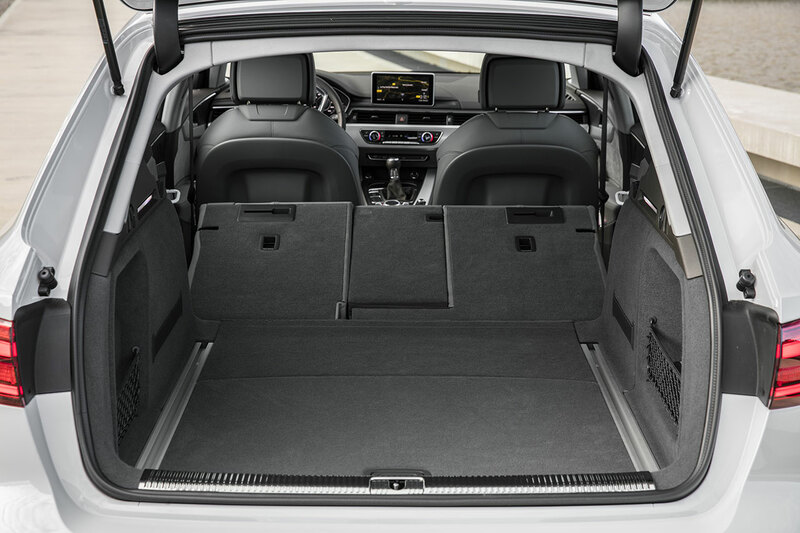 The all-new A4 Avant intelligently integrates a class-leading 505 litres of luggage capacity – extending to 1,510 litres with the seats folded – into a capacious interior that now affords even more head and shoulder room for front seat occupants and offers an increase in overall rear leg room compared to its predecessor. All this can be enjoyed in remarkably hushed tones thanks to numerous aerodynamic and aeroacoustic advances, and in surroundings that exude a degree of quality and technological sophistication that far exceeds even the outgoing car, which was renowned in its own right for its outstanding fit and finish. 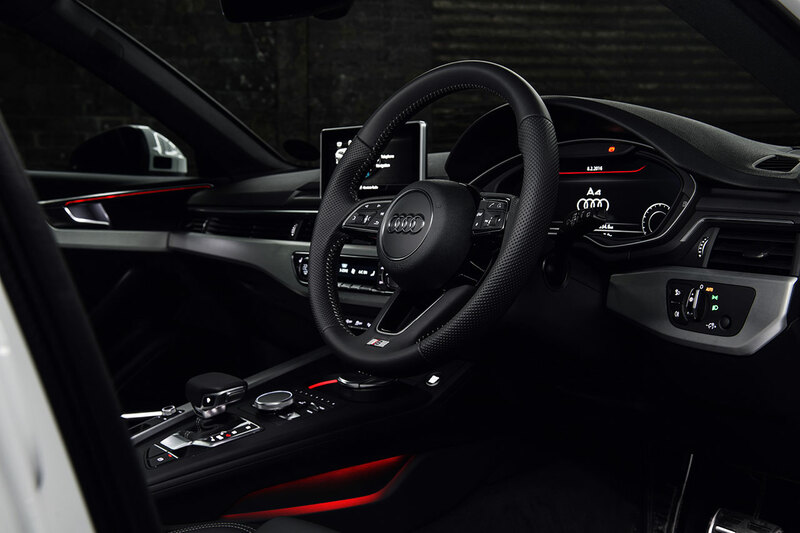 Among the technological highlights are the optional Audi virtual cockpit with its fully digital, absolutely flicker-free display, and optional Matrix LED headlamps capable of establishing and tracking multiple road users and illuminating the appropriate corridors of lights either side of them to maintain maximum visibility without dazzling other drivers. Highlights of the options list also include a 19-speaker, 755-watt Bang & Olufsen audio system with 3D sound, Audi Entertainment mobile incorporating two detachable touch-screen tablet computers built into the rear seats, the Audi phone box bringing two separate Bluetooth connections and wireless smartphone charging* and MMI Navigation plus with a larger 8.3-inch monitor complemented by the MMI Touch fingertip-responsive touchpad built into the rotary controller. These can be added to the three ‘core’ specification levels SE, Sport and S line, each of which offers either Xenon or LED headlamps with LED daytime running lights, along with features including three-zone climate control, cruise control, rear parking sensors and the Audi smartphone interface, which supports Apple CarPlay and Android Auto platforms and displays smartphone contact and information such as navigation mapping on the A4’s seven-inch colour MMI screen. There are also plenty of premium features that greatly enhance everyday use, particularly in the Avant which offers powered tailgate operation and an electrically operated luggage cover as standard. 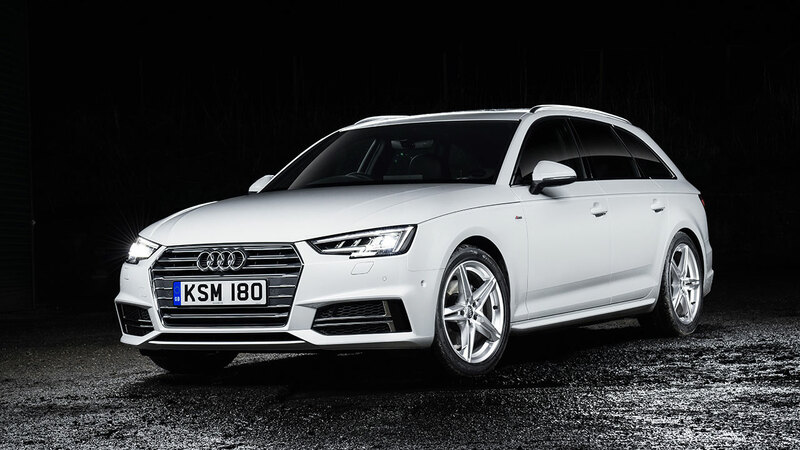 Helped by outstanding drag coefficients of as little as 0.26 and a weight advantage of as much as 120kg compared with its predecessor, the all-new A4 Avant is appreciably more refined and up to 21 per cent more fuel efficient than its predecessor. The Avant engine line-up will initially include a wide choice of 2.0 litre and 3.0-litre TDI engines with outputs starting from 150PS and rising to 272PS. The refined and responsive 1.4-litre TFSI petrol engine at the entry point to the A4 Saloon range will also become available to Avant customers slightly behind the first phase in April 2016. As in the Saloon, two versions of the 2.0-litre TDI engine with 150PS and 190PS power a total of 12 front-wheel-driven ‘ultra’ variants offering up to 70.6mpg with CO2 output of as little as 104g/km – their frugality can be enjoyed in conjunction with both SE and Sport specification incorporating 17-inch alloy wheel designs. The V6 TDI contingent starts with the 218PS version which played such a key role in securing What Car? Magazine’s Car of the Year Award for the saloon – here it returns up to 64.2mpg with a 114g/km CO2 output when combined with Sport specification and front-wheel-drive. To fully exploit the economy potential of this absolutely up-to-the minute engine technology, the powertrain and chassis of the A4 Avant have also been completely redeveloped. The six-speed manual transmission, the seven-speed S tronic twin-clutch (now also available for front-wheel drive) and the eight-speed tiptronic have been reworked, and in the process the automatic transmissions have incorporated a fuel-saving freewheeling function. 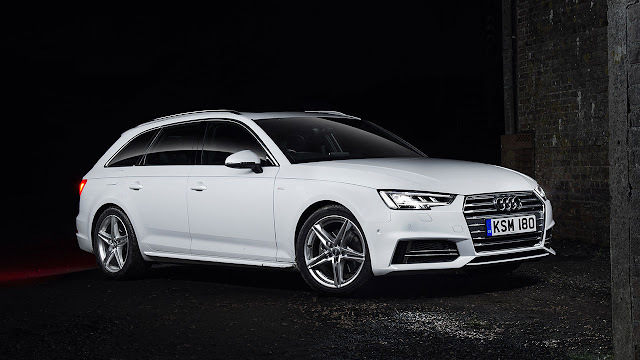 The inherent agility of the A4 Avant with its completely new platform incorporating sophisticated five-link fully independent front and rear suspension can be amplified further by adding a more intelligent and faster-reacting evolution of quattro all-wheel-drive as an option for 2.0 TDI 190 and 3.0 TDI 218 engines. The purely mechanical system with its self-locking centre differential is also a standard feature of the 2.0 TFSI 252PS and 3.0 TDI 272PS versions. All models are available with suspension in either a comfort-focused state of tune or with a tauter and more sporting set-up – the latter is standard for S line versions but can be ‘deselected’ in favour of comfort suspension at no extra cost. For even greater emphasis on dynamic ability it is also possible to specify a dynamic steering system which varies its ratio according to speed and steering angle and adaptive damper control with a ‘sport’ bias for all versions. Adaptive damper control with a ‘comfort’ set-up favouring suppleness can also be specified for all versions bar the ultra models, which are exclusively equipped with sports suspension. Where these options are fitted, their operating characteristics are configurable via the Audi drive select adaptive dynamics system, which is a standard feature across the range. Its Comfort, Auto, Dynamic, Efficiency and Individual modes also have a bearing on the response of the throttle, the shift points of the automatic transmissions if specified and the weighting of the steering. The high quota of standard fit onboard technology can also be complemented by an array of the most advanced driver aids which can take the strain out of everything from reversing out of a parking space into fast-moving crossing traffic to enduring stop-start city driving. Drivers looking to maximise economy will also appreciate the predictive efficiency assistant, which helps drivers to reduce fuel consumption by up to 10 per cent by using navigation route data to alert them to situations in which it would make sense to reduce speed, such as before bends, towns or speed limit signs that are not yet visible. The system can adapt the preselected speed to the route and the speed limits and also take over predictive control of the free-wheeling function of the automatic transmissions.